What you need to know about AirPrint? It's all about HP. 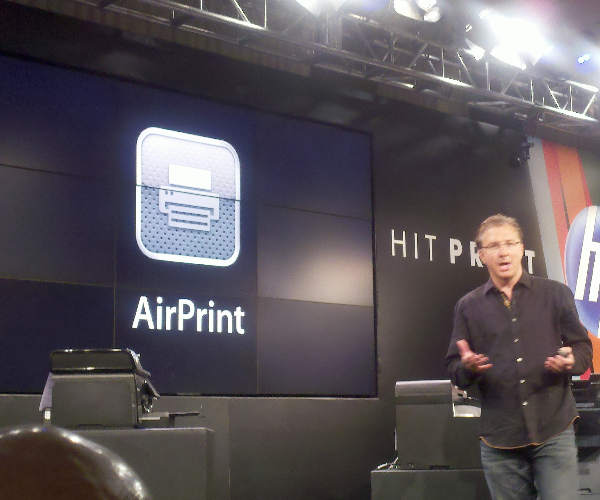 What you need to know about AirPrint? It’s all about HP. The newly-released 10.6.5 had AirPrint rumors swirling around it for quite some time. However, the release notes for the update painted a different picture. There was no mention of AirPrint in the newest OS X maintenance update and it’s since been confirmed by several sources that it’s not secretly buried. The 4.2 Grand Master of iOS doesn’t have any print function with 10.6.5. First it was in, then it was out then nobody was really sure whether it was in or out. From what we can see, however, AirPrint is still being planned for iOS 4.2 (which we’ll hopefully see by the end of this week). The rumors that you’ve been seeing float around refer only to one of the functions of AirPrint, which was being able to print to devices attached to Windows or OS X machines. While that’s a hefty feature, and certainly one that we’d all like to see, what we’re left with right now is HP. Though these are only 5 of the “some” devices that Apple states as being ready to support AirPrint, at least we know that they’re in the market. The question, of course, comes down to how badly you need to print from your iOS device. If you can wait, we’d say wait. At the speed with which Apple has been pushing out updates lately, we’re sure to see AirPrint via Windows and OS X fairly soon.